• Yoko the Yoke flight control. • V3RNIO “TPM” (Throttle, Propeller, Mixture). • All indicators, switches y and navigation equipment used in the real airplane. • GPS replica of Garmin GNS-530 (by Flight1Tech). Soon will be included (C172 Trainer (A2A), C182 Skylane (A2A)). • Plug and Fly Technology: Connect the coms cables to your computer with MFS/Prepar3D, install the drivers and fly! 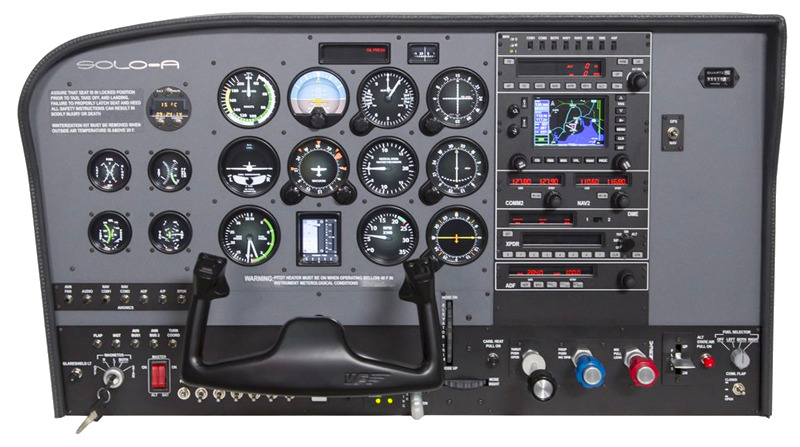 • Processor included processing all panel indicators of the plane, radiostack, switches and GPS, with a high fps. • Forget the mouse to start the engines, tune in radios and any other operation within the aircraft. • The prices includes all remote assistance needed to get the product up and running. •	Six pack: airspeed, attitude indicator , altimeter, turn coordinator, Gyro, vertical speed. •	Engine indicators: Fuel Press - Man Press, AMP – VAC, EGT – CHT, Oil Temp– Press. •	Fuel Quantity: FUEL left right QTY. •	Auto Pilot: AP Master, HDG, NAV, APR, REV, ALT, ARM, VS (up/dn). •	Navigation:NAV1(in GPS), NAV2, DME 2 channels, ADF decimal, transponder SSR. Starting Engine Key of 5 real aviation positions, Master ALT/BAT, Parking brake, flaps, elevator and rudder trim wheels, fuel selector, Cowlflaps, avionics, fuel pump, pitotheat, BCN- LAND-TAXI-NAV-STROBE lights, carburetor heat, Alt Static Air, landing gear, circuit breakers (non functional) , panel light (GlareshieldLT). •	V3RNIO “TPM” (Throttle, Propeller, Mixture). •	2 USB free ports. Plug 110-230 vac, 50 – 60 Hz. •	Cessna C172SP Skyhawk (FSX default). •	Cessna Skyline II RG R182 (Carenado). •	C172 Trainer (A2A) soon. •	C182 Skylane (A2A) soon. Doesn’t include transport or taxes. Does the control panel come fully assembled? Yes, no extra assembly tasks are required. What exactly is plug&fly technology? All of the panels belonging to the SOLOFlightPanel and DUOFlightPanel family work with an internal computer. These computers connect to a MFS-Prepar3D via a network cable, no type of video cable or USB is needed. Must I execute any driver on the computer that runs MFS/Prepar3D? Yes, this is a small driver (communications plugin) which is supplied on a portable memory drive. Must I have FSUIPC installed? Yes, our panels work with both the free version as well as the paid version of FSUIPC. If you do not have either of the two, the free version will be supplied on a portable memory drive. I do not know how to set up a computer network, will this cause me any problems in terms of start-up? Not at all, our plugin recognises the computer that is on the network with MFS-Prepar3D and automatically connects. Should a connection not be successful, Virtual-Fly’s technical support team will connect remotely to activate your panel at no cost. How can I select the instruments panel according to the aircraft type? This is very simple. You only have to press on combination of keys on the panel. Why is an internal computer included? The internal computer carries out all of the functions of the instrument panel, along with the visualisation and movement of the instruments. For this reason, your computer with MFS can use all of its resources for the simulator’s scenarios. With which aircraft is it compatible? Our panels are compatible with all MFS-Prepar3D aircraft. However, there is a large family of manufacturers of ADDONS whose products we have tested and shown they work, e.g. CARENADO (100%). Virtual -Fly starts working when the payment by bank transfer, Pay Pal or credit card is received. At that time, we pack the requested unit and sent directly to the customer’s home or manufacture it in the case of not having stock. Our BATD certified by the FAA. Check it out.